THE LOOP — The dog days of summer came early for Columbia College Chicago students. Volunteers from Chicago-based Canine Therapy Corps brought three pups to the Downtown school's library Wednesday as part of a "de-stress fest" meant to soothe student nerves during finals week. The pet fest marked the second time Columbia's library on Michigan Avenue has hosted dogs, with last semester's event bringing about 600 students looking for stress relief. That was more than double the turnout for any other "de-stressing" event, said Molly Hart, the Columbia library's student engagement liaison. "They say if you're anxious you're living in the future and if you're depressed you're living in the past," Hart said. "Dogs only live in the present." Hart said she got the idea from public libraries that, like hospitals and other organizations, employ therapy dogs. 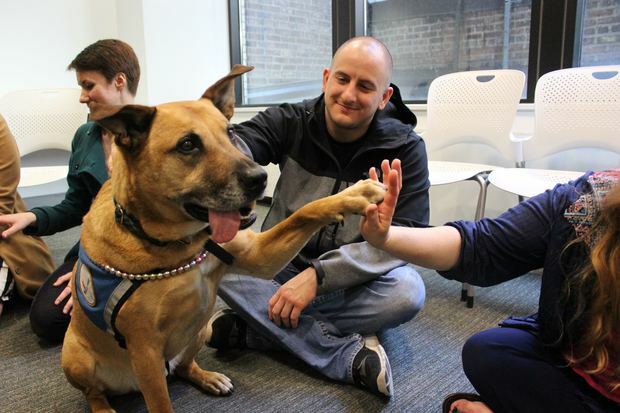 Lakeview-based Canine Therapy Corps uses 60 dogs and has visited other campuses including Loyola University, Northwestern University, University of Illinois at Chicago and DePaul University. "We really believe in the power of dogs and how they can motivate and heal," volunteer Jerry Kirkpatrick said. One of the dogs who came Wednesday was Dude, a 7-year-old "Chicago brown dog" mutt who has been a therapy dog for four years, Kirkpatrick said. Dude, who was shot in the face as a pup and is now missing several teeth, permanently hangs his tongue out his snout. He was very popular with the students Wednesday. "You gotta have the right personality for it, gotta be calm" to be a therapy dog, Kirkpatrick said. One of the students who came Wednesday was Lindsey Keslar, a junior fashion design major who stopped by the library before her last final exam. Keslar said she volunteers at a pet rescue in Forest Glen, and lit up when she saw the flier for the pet event. "It's just something that brings joy to yourself," she said.